Make Break the Mould was a series of creative workshops inspired by the practice of acclaimed contemporary artist Martin Westwood, whose sculptural exhibition These Hands are Models was installed at the Gallery from 6 October – 26 November 2011. Three schools – King Athelstan Primary School, Shrewsbury House Preparatory School and Southborough High School, along with young people from the Anstee Bridge Programme and local children from the Stanley Picker Gallery Art Club enrolled as partners on the programme. 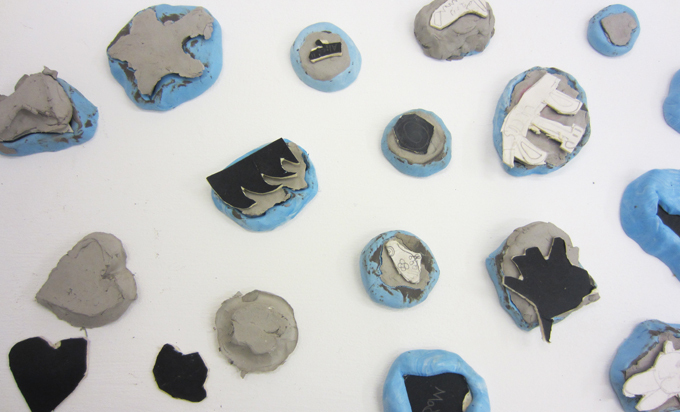 Throughout Make Break the Mould participants explored Westwood’s exhibition and responded by making their own collages, drawings and sculptures out of clay. They interviewed Westwood and visited his studio and ceramic workshop, questioned professional sculpture and Kingston University Fine Art graduate Rebecca Wilson, and learnt about specialist materials, equipment and techniques such as extruding and press-casting before using them to create their own, unique artworks. Finally groups collaborated to design a group installation ready for one of two programme exhibitions which celebrated the achievements of all involved. These inventive exhibitions were titled These Hands Are For Making by children from King Athelstan Primary School, Shrewsbury House Preparatory School and the Stanley Picker Gallery Art Club, and Casting Ideas, curated by young people from the Anstee Bridge Programme and Southborough School. The Stanley Picker Gallery team were extremely impressed by the creativity, open-mindedness and team work displayed by all.